If you’ve spoken to anyone about the newest production of The Glass Menagerie on Broadway, then you already know that not one person has a bad thing to say about it. As a result, I feel like this review might end up being a little bit gratuitous – simply one more positive response to add to the mix. But if you’ll indulge me, it is a beautiful revival, literally and figuratively. 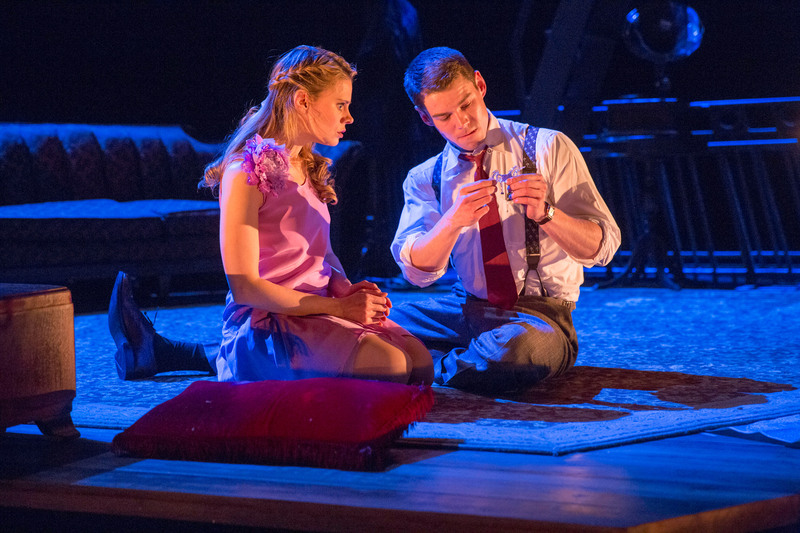 The set and lighting design alone create the space for Tom’s memories to take form. Much of the stage is dark with only certain pieces of scenery highlighted, patchy in the dark corners of his mind. There’s a fire escape that leads to nowhere and a home floating on a reflective surface. We too float in Tom’s memory. The memories are also physicalized through movement, repeated gestures, the appearance and disappearance of characters, private moments as characters loom over the edge of the living room. Despite the beauty of the design elements, we know that most people see this play for the acting. These are four iconic roles, and across the board, these actors will not let you down. You might think you’re only going for Cherry Jones (Amanda) or to see Zachary Quinto (Tom), but Celia Keenan-Bolger (Laura) and Brian J. Smith (Gentleman Caller) are just as excellent. Quinto is enticing in his Broadway debut. His southern drawl draws everyone in from the opening moments. Keenan-Bolger gives a beautifully subtle performance as the extremely shy Laura. In the first act, she practically blends in with the scenery. The brilliance of this play and John Tiffany’s direction is that the audience reaches intermission craving the arrival of the Gentleman Caller just as much as the Wingfields. We crave the new energy, a new character to shake up the status quo. Maybe he really will be the answer we’ve all been looking for. Which brings me to the Gentleman Caller scene. I swear, sometimes I think that scene is all Tennessee Williams needed to write. It’s so real and beautiful and absolutely heart-breaking. This particular performance is so incredibly private and fragile; it feels like it’s just you, Jim, and Laura sitting together on the floor for hours. It was also a nice change to see a new interpretation of Jim. He isn’t portrayed as the perfect cut-out of a man. He has struggles of his own – with his work, his future, and his confidence. He and Laura aren’t so different after all. It’s astounding to me that in such a short amount of time, the entire audience can feel the same kind of crushing disappointment that Amanda feels and the guilt that plagues Tom. The Glass Menagerie is going to be the piece that people talk about all season long. This production made me see this classic play in a completely new light. That’s the whole point of a revival, right?